Proud mommy Jessica Keipper sent us this precious photo of her baby Kiley Ann! "This is Kiley Ann, she is 2 months old, almost 3, born on 8/8/10. She wore this beautiful dress for her aunt's wedding. She got so many compliments on it!" Isn't she so cute? We love seeing the matching headband and flower being worn with this spectacular dress. Thank you Jessica for taking the time to send us this lovely photo of little Kiley Ann! It's always a delight for us to receive photos and little recaps from our happy customers. 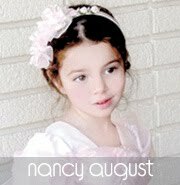 Kiley Ann is wearing NancyAugust.com's Divine Off White Infant Dress with Gold Diamond Embroidery, Item Id: GG3407B-OWHT. This beautiful infant dress incorporates so many classically beautiful design qualities that makes it idyllic for so many different occasions! This fancy infant dress is made of high quality taffeta in an off-white color. The simple sleeveless bodice and voluminous skirt is enhanced in beauty with a brown and gold diamond pattern accented with dainty floral embroidery. The look is finished with a golded waist sash and hem ribbon. This fantastic little number is accompanied with matching bow headband and a detachable flower pin. This sophisticated and beautiful infant dress will look adorable on your little one and she will garner so many loving compliments just like Kiley Ann!